The Victorian woman wore an extraordinary amount of underwear. The basic items consisted of chemise, drawers, corset and several petticoats. In general, these main garments remained throughout the period, but new ones were added (and taken away, too), including crinolines, bustles, corset covers and combinations. Underclothing can be separated broadly into two kinds - underlinens and structural garments - not a distinction the Victorians made. Underlinens, such as chemise, drawers, petticoat, corset covers and combinations, protected the valuable corset, dress and outer clothing from the body. They could also provide warmth. Structural underwear, such as corsets, bustles, crinolines and bust-improvers, created the fashionable silhouette. A chemise and a pair of drawers were worn next to the skin. (By the 1870s, they could be substituted with a combination garment). The corset was put on over the chemise and drawers, to shape the figure. Then an under-petticoat was worn over all of these. It was sometimes all-in-one with a petticoat bodice, or it could be a waist petticoat with separate corset-cover. (Later in the century, the petticoat could be put on underneath the corset). A skirt support such as a crinoline or a bustle could be worn over these, depending on the prevailing fashion. This was covered by a decorative petticoat that was sometimes the underskirt of the dress itself. The minimum number of petticoats worn was generally two, though it was fashionable to wear many more, prior to the invention of the cage crinoline. Sometimes the skirt support was incorporated into one of the petticoats, e.g the corded petticoats of the 1830s, or the horsehair jupon of the late 1860s. Finally the dress could be put on over this assemblage of underwear. This protected the corset and dress from the skin and vice versa. The early Victorian chemise or shift was voluminous and made from quite firm, white linen, usually undecorated. It was often short-sleeved (plain or puffed), calf-length and had a square flap that folded down over the top of the corset. 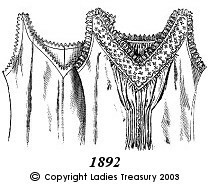 Other early necklines for day wear included round or square, (without flaps and occasionally with triangular bust gussets let in at the front). An alternative for evening and summer dress was low and oval, sometimes gathered into a band that fitted around the edge of the shoulder, over the top of the arms. By the 1860s the flap-fronted chemise was not widely worn and the evening, low-necked style could be worn during the day also. It was usually made of cotton and often embroidered. Sometimes a moderately low neck band formed a yoke, extending into a front placket opening, giving a modified T-shape. During the 1870s the dress bodice (called a cuirasse bodice) became very long and tight. The chemise became less voluminous, shorter and often sleeveless. It and with vertical tucks was sometimes shaped to the waist at the side seams under the bust. By the end of the century, the chemise had become a very simply cut, sleeveless garment with narrow shoulders and a round, square, V or heart-shaped neckline. It was however, very highly decorated with lace and embroidery and made of fine cotton or linen and even silk. The evening chemise worn with sleeveless, decolletee dresses, was cut straight across the top, with separate narrow shoulder straps. This style became increasingly popular during the early twentieth century. Drawers were not universally worn during the early nineteenth century. But examples and patterns of drawers exist from the 1830s and 40s suggesting that some women wore them. With the onset of the cage crinoline in the 1850s, it became essential to wear drawers, for warmth and due to the risk of embarrassing accidents. Early Victorian drawers tended to come down well below the knee. Each leg was finished separately and joined together at the waistband only, leaving the crotch seam open. The legs tended to be cut straight without a band at the bottom. Bagginess at the seat prevented the open seam from gaping. Drawers continued to be cut in this way at the back even when the seam closed later in the century. Many had drawstring casings at the waist and they generally all tied or buttoned at the centre back. During the 1860s and '70s drawers shortened to just below knee level. They were sometimes gathered into kneebands and often had a hip yoke to reduce fulness at the waist. The version with kneebands became known as knickerbockers (abbreviated to knickers). By the end of the century some drawers were wide-legged and flared. This was to become the fashionable style of the Edwardian era. The older knickerbocker persisted, sometimes in wool or even chamois leather, for sports. Both old and new styles could fasten at the back as before, at the sides with one or two plackets or with a falling back flap which buttoned onto the waistband. The flap-fastening drawers were closed at the crotch seam - preferable under sporting costumes. During the whole Victorian era, women's drawers were perhaps the most immodest and unmentionable garment of all - quite something in an age when almost everything seems to have been immodest and unmentionable. These consisted of a chemise and drawers united in one smoothly-fitting garment. They arose in the 1870s when the fashionable silhouette was so tight that as much bulk as possible was eliminated. As with ordinary drawers, the crotch seams were usually left open, and some examples incorporated the buttoning back flap and closed seams. Though perhaps meant to be a fashionable innovation, the combination garment was hijacked, as it were, by the dress reform movement, who wanted to reduce the number and weight of clothing worn by women as a rule. 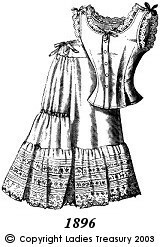 A reformed version, sometimes called a combination divided skirt (still a chemise and drawers combined) had long, wide legs that were intended to replace the petticoat too. It is not surprising that highly fashionable ladies did not really take to this garment until the Edwardian era. The petticoat had a dual role as both an underlinen and a structural garment. It protected the dress and provided warmth as well as modesty (by masking the contours of the legs) - all functions of underlinens. It also helped to shape the dress and therefore mirrored the cut of the skirt. Early Victorian petticoats, like skirts, were cut from straight lengths of fabric. They often had a petticoat bodice attached. As skirts grew wider, so did petticoats, losing their attached bodices in the process. Several petticoats were worn at once to create the bell-shaped skirt, before the invention of the cage crinoline. Some early Victorian petticoats were corded - i.e. had tucks with cords threaded through - which helped to hold out the hem, especially when starched. Others had horse hair (or crinoline) in the hem and across the back - the first crinoline petticoats. With the advent of the cage crinoline in the mid 1850s, it is generally thought that the number of petticoats was reduced to a minimum of two - one moderately full one for under the crinoline, providing modesty and warmth and at least one full, often flounced petticoat, over the crinoline, to soften the outline of the steel rings. The outer petticoat could be decorated around the hem, where it was most likely to be exposed, with broderie Anglaise (or eyelet embroidery) and braiding patterns. During the 1860s, short walking costumes were worn, with skirts looped up displaying the crinolined petticoat. Decorative, coloured petticoats became popular, often scarlet decorated with black. In the late '60s the crinoline collapsed and petticoats became narrower. Skirts and petticoats were gored (sewn in panels narrow at the top and wide at the bottom) and trained. Gored petticoats stiffened with horse hair were often the main skirt support until 1870. Petticoats with cascades of flounces down the back were worn in the 1870s and '80s. These picturesque garments aided in projecting the skirt backwards and in masking the steels of the bustle. By 1876, the bustle had collapsed temporarily and the skirt and petticoat became sleek and trained. A horizontal drawstring at the back of the knees held the petticoat in, below which it fanned out into a flounced train that could be detached. In order to reduce bulk, fashionable women often wore only one petticoat under the dress and some wore this petticoat underneath the corset. Others wore no petticoat at all, except a lace flounce simulating one, tacked inside the dress underskirt. During the 1870s the one-piece petticoat reappeared - the princess petticoat, after Princess Alexandra. This time the bodice was cut in one with the skirt without a waist seam. In the 1880s, the bustle returned, skirts and petticoats widened and were often cut from straight widths or slightly flared panels. Gored skirts and petticoats returned in the 1890s. 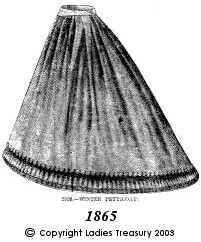 The triangular silhouette of the gored petticoat was further emphasised by a lace-trimmed frill at the bottom. Stiff silk and alpaca petticoats were worn, as well as cotton. Silk produced the characteristic rustle of the '90s skirts, called frou-frou. In the late 1890s, skirts softened in outline to give a curved flare below the knee. Petticoats followed and often had circular flounces at the bottom. This line would characterise the skirts and petticoats of the Edwardian era to come. Flannel was a fabric used for underwear in general and for petticoats in particular. Red flannel petticoats were very fashionable in the 1860s and remained popular throughout the rest of the Victorian period. 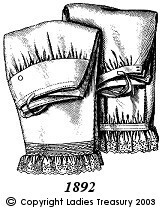 But they were by nature very bulky and by the 1890s were perhaps more sensible than fashionable items of underwear. Jupon was the French term for underskirt or petticoat. It was used to describe conventional petticoats, horsehair petticoats and even cage crinolines. The petticoat had became the ultimate symbol of femininity by the late Victorian period. A riot of frills and lace, it would continue to reign supreme in the Edwardian age. When the chemise with front flap declined by the 1860s, the corset cover, petticoat- or under-bodice is said to have arisen to takes its place. In fact, petticoats with attached bodices had been worn in the early nineteenth century. The petticoat bodice merely separated from its corresponding skirt. This separate petticoat bodice became known as a corset cover. It was either waist length or longer, front-opening and fitted to the figure by means of front darts and sometimes curved side back seams. The cut reflected fashion and could be sleeveless, short- or long-sleeved. Not only did the corset cover protect the dress and corset from each other, it provided added modesty with gauzy summer and evening dress bodices, preventing the corset from showing at the neckline of the dress or through a sheer bodice fabric. It became increasingly decorative during the century.